The new ultra compact XA10 Professional Camcorder is designed for situations where mobility is critical while shooting. This feature-rich, professional model records Full HD 1080p using an AVCHD codec. The new ultra compact XA10 Professional Camcorder is designed for situations where mobility is critical while shooting. This feature-rich, professional model records Full HD 1080p using an AVCHD codec. The ultimate professional camcorder for run-and-gun shooting, the compact XA10 includes a detachable handle for low-angle shooting and portability. With the handle attached the XA10's functionality is further enhanced with the addition of XLR inputs and an external microphone holder. The XA10 features the AVCHD codec. AVCHD (Advanced Video Coding High Definition) was announced in 2006 and is quickly becoming the standard for professional camcorders. AVCHD utilizes MPEG-4 AVC/H.264 compression technology similar to the technology used in Canons HD DSLRs. 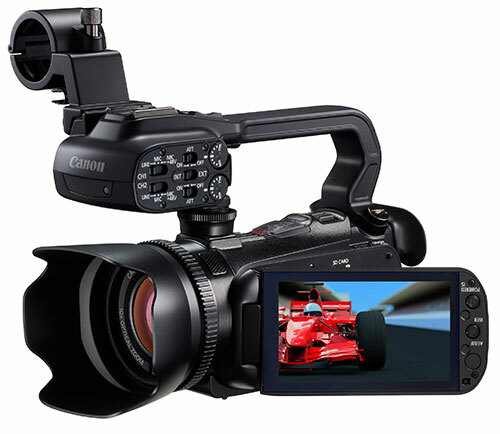 The XA10 Professional Camcorder features Canon's powerful DIGIC DV III Image Processor, which provides enhanced shading, lifelike tonal gradations, and lower power consumption. DIGIC DV III is also the high-speed engine which powers a variety of Canon technologies; Genuine Canon Face Detection, Touch & Track, and Cinema-Look Filters. On-the-go videographers will appreciate the ability to track one subject in a crowd of people.